Your office building is home base for your business. If your enterprise had an Alamo, it would be your office. Your offices are more than just the place where your employees gather to work during the day; it’s where you keep your business’s valuables and secrets and, occasionally, fairly large sums of its money. If your business needs an office, your office needs a security system. Here are six reasons why. An unsecured office is a viable reason not to take a business seriously. That padlock on a chain you have strung between the two handles on your office’s front doors makes it look like you’re running a fly-by-night operation. Would you give your credit card number if you knew it was going to be stored on a computer in an office that doesn’t have an alarm? Even more valuable than your property, your business reputation could be damaged. One of the great things about having a security system is that they come with a sticker for your door or window or a sign for your yard telling potential criminals that you have one. Criminals want to get away with their crimes, so the sticker alone can convince them to move along to the poor sap who thought a window lock could keep him out. Be the office that burglars walk away from, not toward. Most modern security systems can alert the appropriate authorities to several different kinds of emergencies: break-ins, fires, even floods. Unlike an issue at home, you’re not there to call the police. When a burglar hears an alarm, he’ll know red-and-blue lights aren’t far behind and expedite his exit. If teenagers with spray-paint cans had a sworn, mortal enemy, it would be motion-detection lights. Some people aren’t looking for money or computers or financial data. Some people just want to destroy property—or use it as a place to hang out or party or divvy up the spoils of a jewelry store robbery or any number of things. Have your motion-sensitive lights let them know they’ve chosen the wrong building. 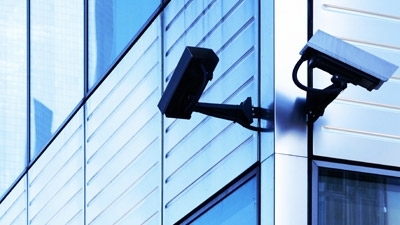 Security systems not only keep an eye on your office building for you, but they record what they see. A video record of everything that happens in and around your building will provide a formidable defense against grifters looking for a quick buck by accusing you of some negligence or action for which they can sue. A secure, safe building with a good alarm system is a much more attractive investment for an insurance firm to make—and those with good security can almost always find a better rate on a policy. Your office is your business’s fortress. A good security system protects it from not only burglary, but vandalism, fire, and floods. If a high-end system is too pricey, get what you can afford now and upgrade later.